The Kingdom Hide, our loch-side hide which was built by Johnny Kingdom in 2007, is the perfect place to spend an evening wildlife watching. Nicknamed the ‘beaver hide’, there is so much more to see than just the beavers. Myself and another ranger decided to spend some time there on the evening of the summer solstice, when we would have maximum daylight. It wasn’t long before we got our first amazing sighting. 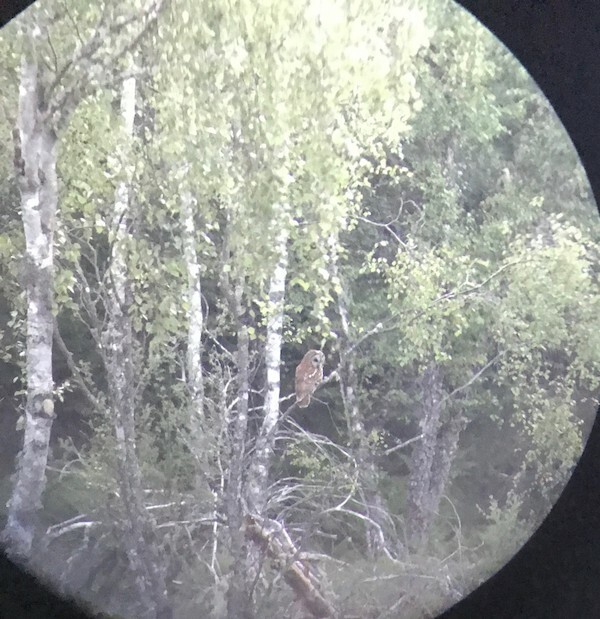 Looking around, we saw a tawny owl (Strix aluco) perched in one of the trees at the side of the loch. It was turning its head, searching for prey. 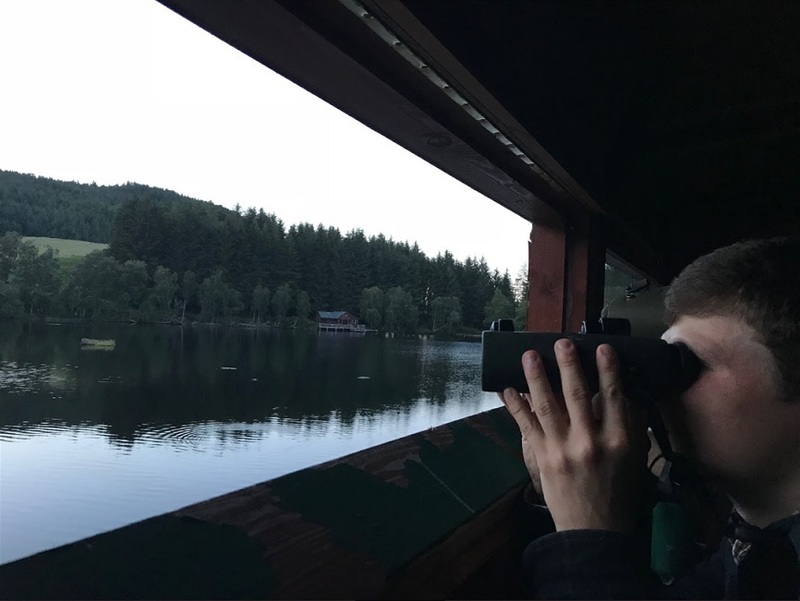 After watching the tawny owl for a few minutes, we carried on scanning the loch and the surrounding greenery and caught a glimpse of something moving through the trees on the other side of the water. It was a pine marten (Martes martes) running along the boardwalk opposite where we were sitting, possibly heading back to its den after munching on some peanuts at the Campbell Hide. By this point we were already amazed by our luck so far, but we carried on waiting patiently in the hope of seeing a beaver (Castor fiber). Before long, we heard a splash in the water below us and looked down hopefully. Instead of a beaver, what we saw was two otters (Lutra lutra) swimming past! Our eyes followed them as they swam directly past the front of the hide until they were into the shadows and out of view. 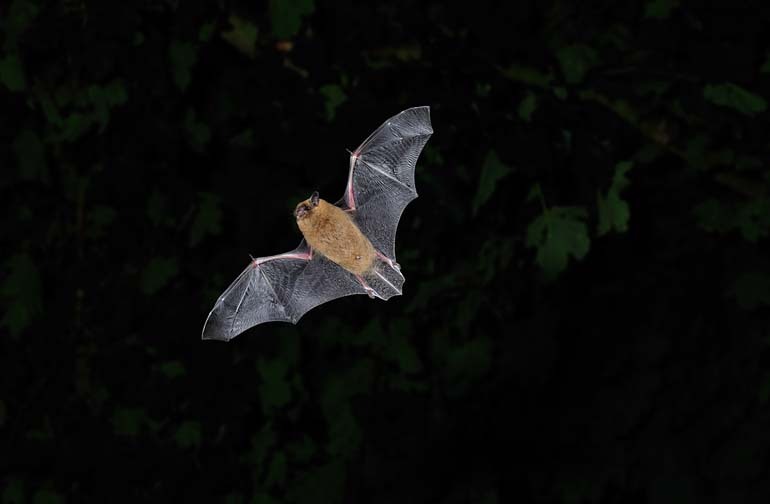 Almost immediately after the otters had disappeared, one of the many pipistrelle bats (Pipistrellus pipistrellus) that had been flying across the loch swooped down and snatched a moth right in front of where we were sitting. Across the loch, on the hillside opposite, we saw movement. A bachelor herd of red deer (Cervus elaphus) were making their way across the field. A splash nearby brought our attention away from the deer and onto the water. The two otters were back, swimming close to the banks of the loch. They kept diving under the surface and disappearing from view, resurfacing in a new location. There was a distressed mallard (Anas platyrhynchos) that kept flapping its wings and alarm calling as the otters got closer to it. Instead of flying away it kept on moving just a few metres further away at a time so it was a tense few minutes of watching the otters chasing it across the loch. They made it halfway down the length of the loch before the otters changed direction and headed into the vegetation around the edge. We waited a bit longer to see if they would reappear and when they didn’t, we decided to call it a night. Unfortunately, we didn’t manage to see a beaver that night but there is no way that we could have been disappointed with such amazing other sightings! Words by Tierney Chalmers. Images all by Tierney, except the Pipistrelle which is by Laurie Campbell.